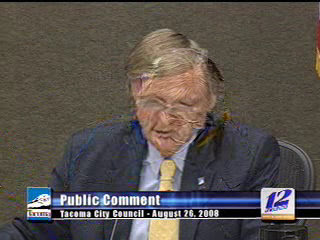 "Tonight we are short one of our most prolific public commenters. 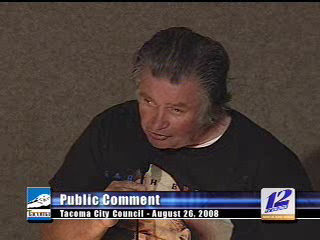 Mr Guthrie of Peanut Butter Jelly Street Ministries, who always spoke with kindness to the council was a fierce advocate of Homelessness Awareness in Tacoma. Well he got sick and passed on recently. He's in a better place now and we will all miss him we of the city council. He was a character." RR Commentary: oh man. I am seriously bummed out now. by Marty on 9/4/2008 @ 4:30pm I have known Jerry for about a dozen years. Long before he was a homeless advocate. He used to bring his son into Stadium Video and we would engage in long civic discussions. Much of Jerry's passion for homeless came from how he saw his fellow Vietnam Era Vets treated (or mistreated) by our social system. Lately he began trying to open more dialog about the state of programs for the returning Iraqi veterans and thier needs. I believe that his son is now a police officer and I wish the best for him. by NineInchNachos on 9/4/2008 @ 4:46pm thanks for sharing the memories Marty. I don't know much about him outside his TV Tacoma presence.